OURAY STAGE & BUS CO., Around the Circle Route, Pass No. 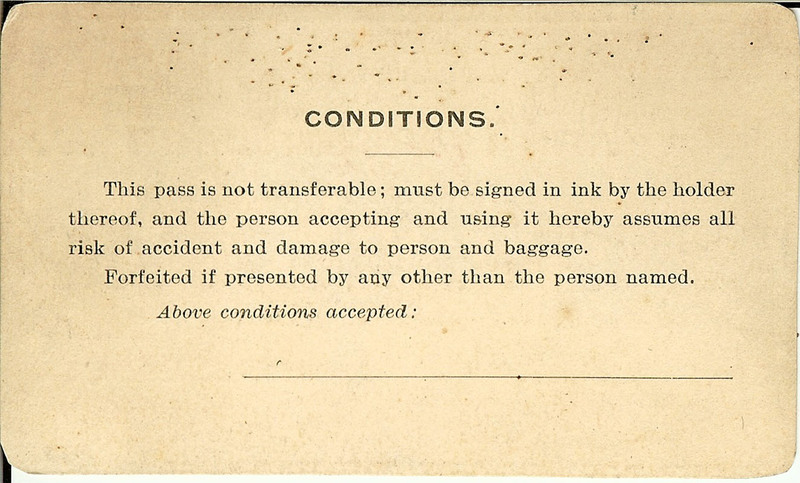 106, Annual Pass, issued 1890. Issued to F.S. Rockwell and wife, Denver & Rio Grande Railroad. E.E. Brinson, Manager. Near fine condition. No printing on back of pass. 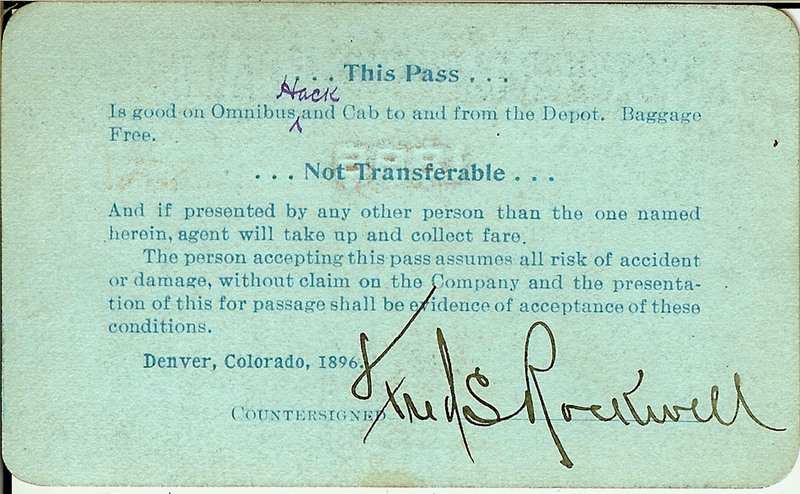 An original stagecoach pass for travelers in southwestern Colorado. This Company worked in conjunction with the Denver & Rio Grande Railroad and The Rio Grande Southern Railroad to transport passengers and goods to the near-inaccessible mining and logging camps in Ouray, San Juan, and San Miguel counties of Colorado. Its route included Ouray, Silverton, Ophir, and Telluride, as well as other small towns and villages in the surrounding San Juan Mountains of Colorado. 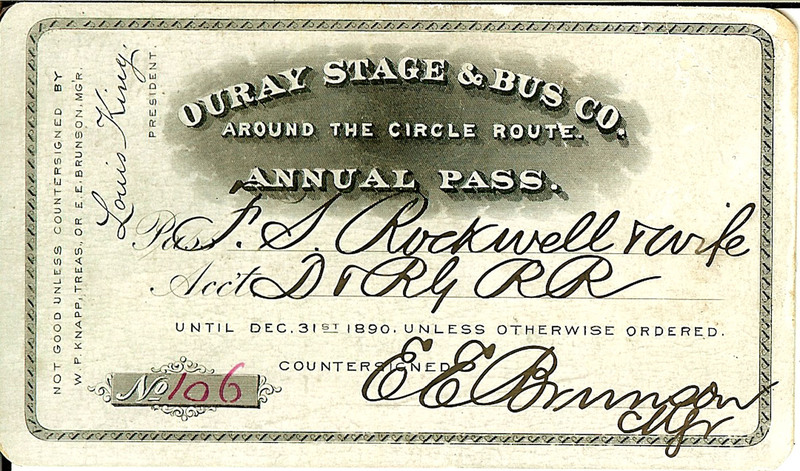 COLORADO STAGE AND TRANSPORTATION COMPANY, Pass No. 46, issued 1897 to F.S. Rockwell, signed by H.S. Harp, proprietor, near fine condition. This stagecoach company was owned by H.S. 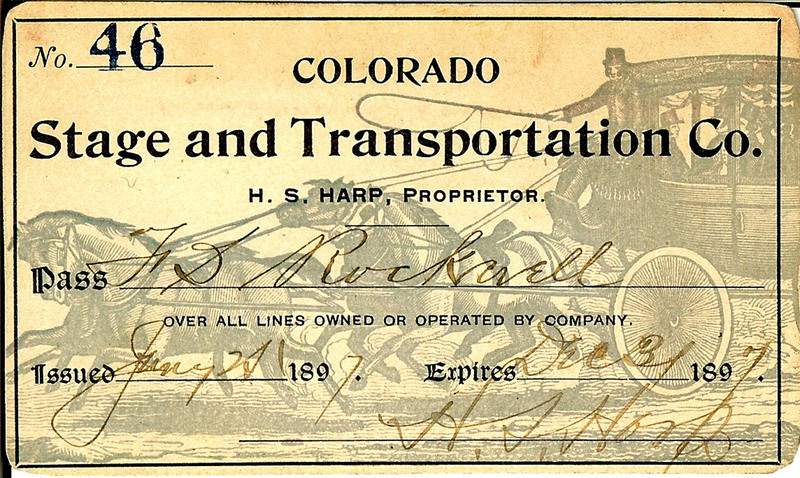 Harp, who had owned and operated stagecoach lines between Newcastle and Meeker, Colorado since 1887. "Simp" Harp sold his first line, and then started another stage line known as The Harp, Wright and Daum Stage Company, running between Glenwood Springs and Meeker, Colorado. This line was no a success. Harp went on to form the Colorado Stage and Transportation Company, operating in Colorado's northwestern region, between Glenwood Springs and the Utah border. 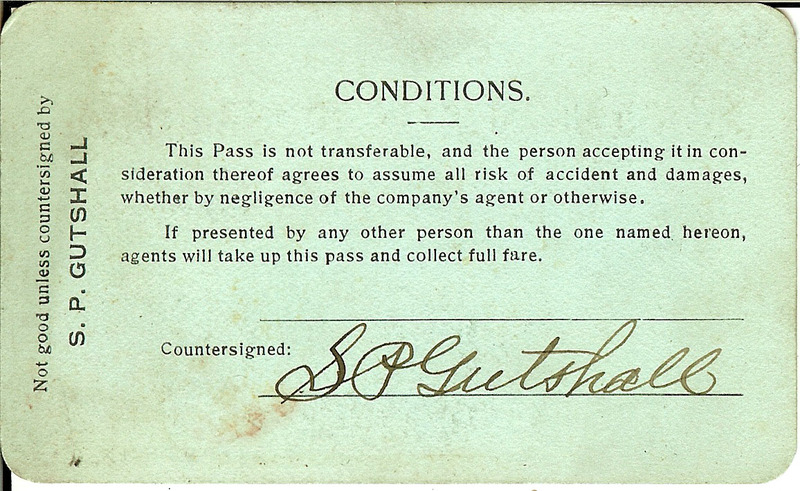 A very rare Colorado stagecoach pass in near fine condition. THE CIRCLE ROUTE STAGE COMPANY, Pass No. 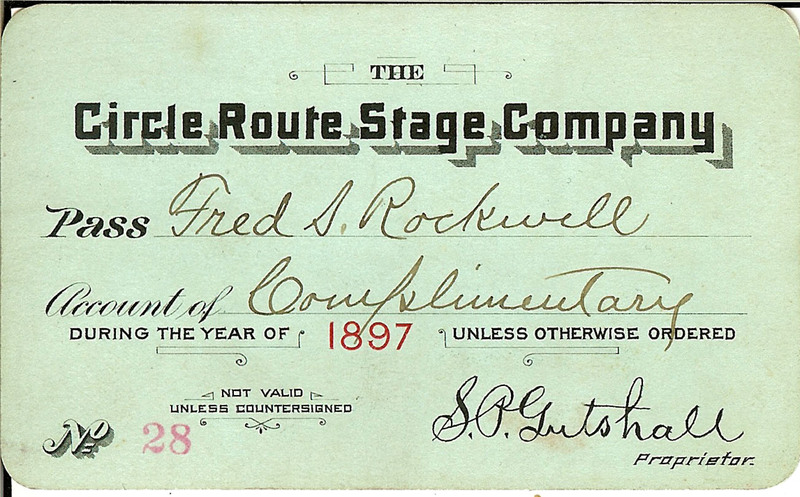 28, issued 1897, to Fred S. Rockwell, near fine condition; countersigned by S.P. Gutshall. This stagecoach was associated with the Rio Grande Southern Railroad. S.P. Gutshall operated sawmills in construction with the RGS; but also operated a stagecoach in association with this railroad for the transportation of passengers and materials to the more inaccessible places, such as mines and logging areas. Stops on the Circle Route included Jays Station, Hagen, Leonard, and Brown's. 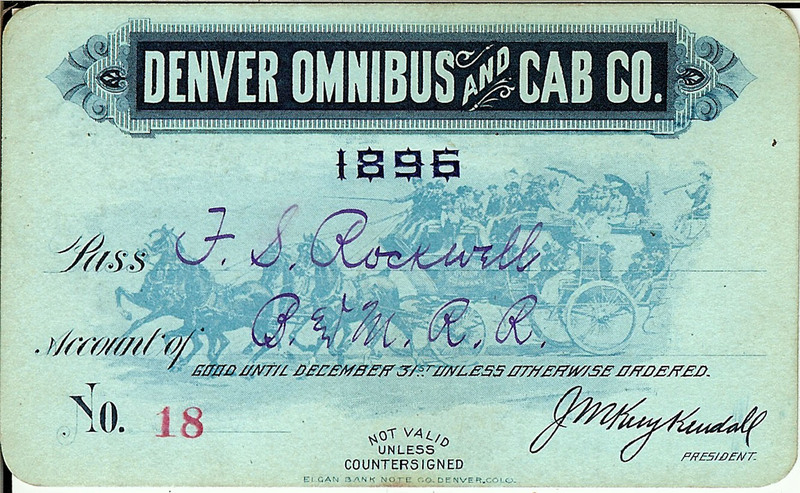 DENVER OMNIBUS AND CAB CO., Pass No. 18, issued 1896, to F.S. Rockwell, near fine condition; signed by F.S. Rockwell on back. 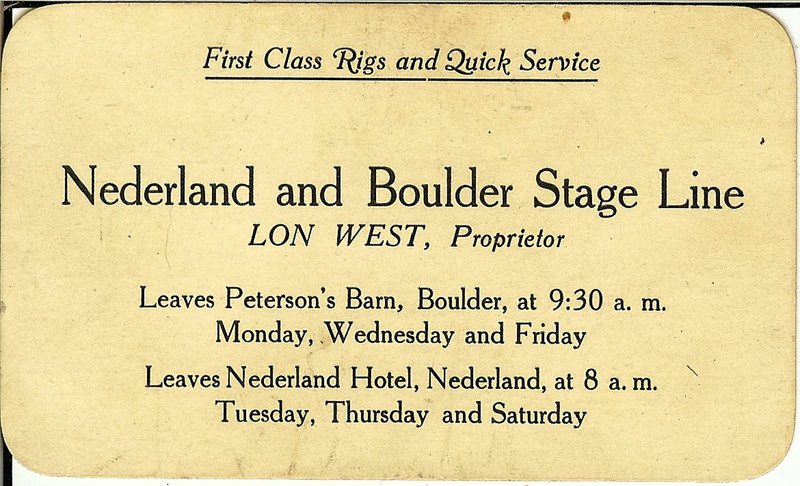 NEDERLAND AND BOULDER STAGE LINE, Lon West, proprietor, First Class Rigs and Quick Service, circa 1905.